Headlights are like the eyes of a car or truck, both in terms of function and style. Obviously, headlights are tools for visibility. But they are also important in providing a vehicle with a distinctive look, just as the shape and colour of our eyes make one face distinguishable from another. Trying these headlight upgrades on your car or truck is like giving it a fresh set of eyes with improved nighttime vision or a more customized look. If you drive an older vehicle with hazy or yellowed plastic headlight lenses, you can easily improve both the style and safety by polishing the lenses using a headlight restoration kit. We tried it on a 10-year-old car with great results. Not only did the car look better, but the headlights also proved much more effective at lighting the roadway at night. The kits available are an ideal DIY solution: quick, easy, and cost-effective. Halogens are the standard for modern cars and light trucks. Halogen bulbs are part of a capsule that can be easily replaced with premium capsules from NAPA Lamps for unique style and better visibility. There are several options available. Upgrading your headlights with NAPA Lamps premium halogen capsules not only improves nighttime driving safety but also freshens up the look of your car or truck. You may be tempted to install HID headlights that use a high-voltage xenon arc lamp instead of an incandescent bulb like a halogen. Sylvania ZXE bulbs bridge the gap between pricey HID conversions and conventional halogens.The look is cool blue, similar to HID lights. But as with NAPA Lamps premium halogens, upgrading is as simple as unplugging the old capsules and fitting in the new ones. Choose Sylvania ZXE capsules for the look of HID without the expense of conversion. Although still reserved mostly for high-end vehicles, HID headlamps have been available on new cars for about 15 years now. So plenty of drivers already own cars or trucks with HID or xenon headlight systems. HID bulbs are brighter and longer-lasting than halogens, and HIDs direct light better and more evenly. But intensity drops over time. If you drive an older vehicle equipped with HIDs, it may be time to replace the bulbs. According to recent surveys, an HID bulb loses about 70% of its intensity as it reaches the end of its 2,000-hour lifespan. He recommends replacing aging HID bulbs to restore their original performance. If you drive on unpaved roads or need to go off-road for your work, you can also add additional light system on your vehicle. The easiest way is to add a LED light Bar, as the one offered by Grote. This will give you more lighting power without draining power from your battery or alternator, thanks to the LED technology. Ready to improve the safety of your vehicle, while adding a dash of style? 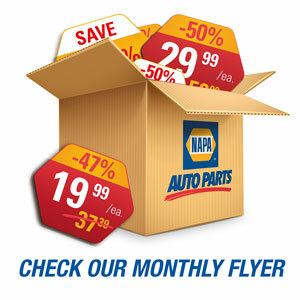 Find the parts you need at napacanada.com, or visit your local NAPA Auto Parts store for a hands-on look at these and other options.